My cat, Jasper, has the paws of evil. He was adopted off the streets about a year ago, and we tried everything to get him to stop scratching- tin foil, double sided tape, sprays, cat nip, scratching posts and he wouldn't use or respond to any of it. He tore up the carpet and wrecked the paint of all the corners of the wall. At my wits end, I finally turned to the internet, and stumbled over these. They have absolutely saved my house. They are easy to put on, and he has no idea they even exist. I love my cat, and I love his Soft Paws! I want to thank you for sending my Soft Paws order. I am very pleased with them and only wish I had heard about them long before now. My cat just loved to tear wallpaper—Soft Paws has now put a stop to this. I shall be ordering more from you again. Once again, thank you very much. I have been using Soft Paws on my older kitty for 3 years now (he just turned 3), and I LOVE them! He was the kind of kitty that would climb to the top of the screen door! My husband and I just got a new kitten and we are using Soft Paws on him too. We all love soft paws at my house! I thank you, thank you, thank you for this product! Although I do understand why people do it, I will never ever de-claw my cats. We are about to move in to a beautiful new place and have purchased brand new furniture. 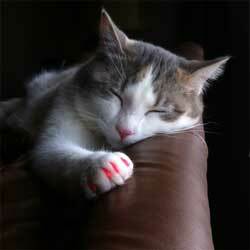 I had heard about Soft Paws and ordered them on 03/02/04. They just arrived today, 03/05/04, and I was nervous about how the application was gonna go. I have 2 cats. Milo is laid back and receives insulin shots 2 x's a day. He does not need the sp's. Missy, on the other hand, is not as laid back. I have been massaging her toes all week in preparation. I came home and headed straight into the bathroom. I grabbed her up and the WHOLE process took less than FIVE mins.! It is also the cutest thing I have ever seen. She is a pastel calico but her legs and paws are solid white. I bought the red so they really stand out! I am a customer for life and will tell everyone about this product! Just a quick note to let you know that my kitten Stella is doing very well with her claw covers and I love how they look on her feet. I would also like to thank you for adding in extra applicator tips with my order. The first week of use with the product did involve reapplying the covers. Now Stella has adapted to them very well. I just had to write a message. Thank you so much for such a great product! My cat actually let me put them on and is now totally used to them and it's almost like she forgot about them. And the best part is that my roommate is no longer freaking out about her ripping the couch, AND I can leave her in the living room all day with confidence. Thank you! I will be a loyal customer now.